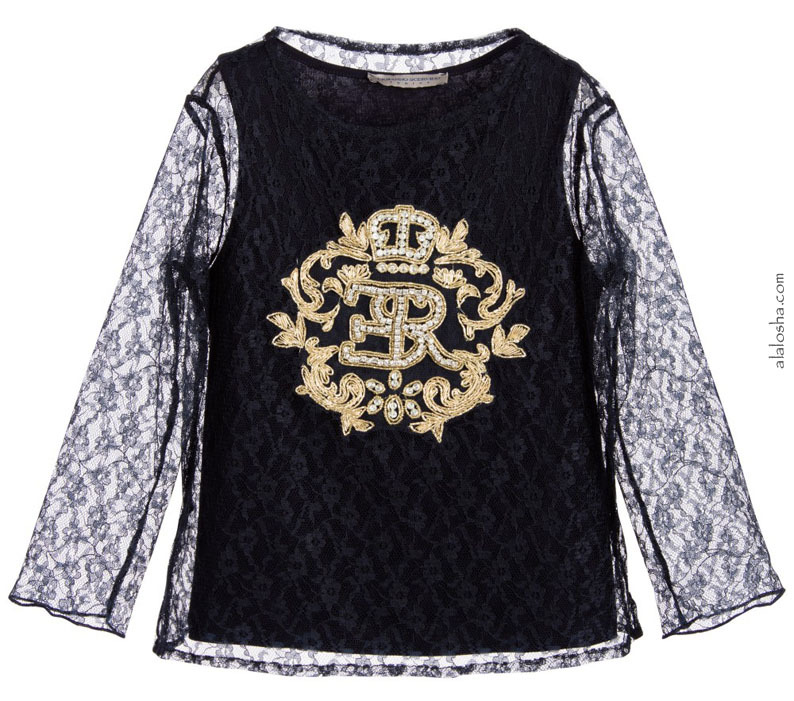 Girls gorgeous, navy blue top by Ermanno Scervino, featuring a large crested logo on the front, embellished with elaborate, gold brocade and crystals. This vest top is made in soft jersey with a lovely lace overlay and sleeves, which are see-through. Easy to wear, it simply pulls on over the head. 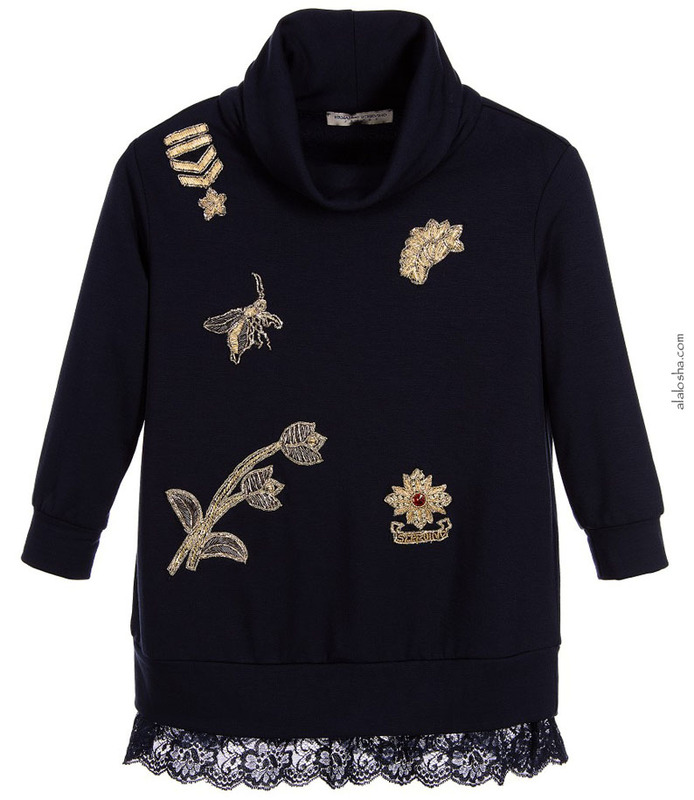 Girls gorgeous navy blue cardigan by Ermanno Scervino. Made with a super soft, fluffy, fine knit, it has a round neckline and fastens with buttons at the front. 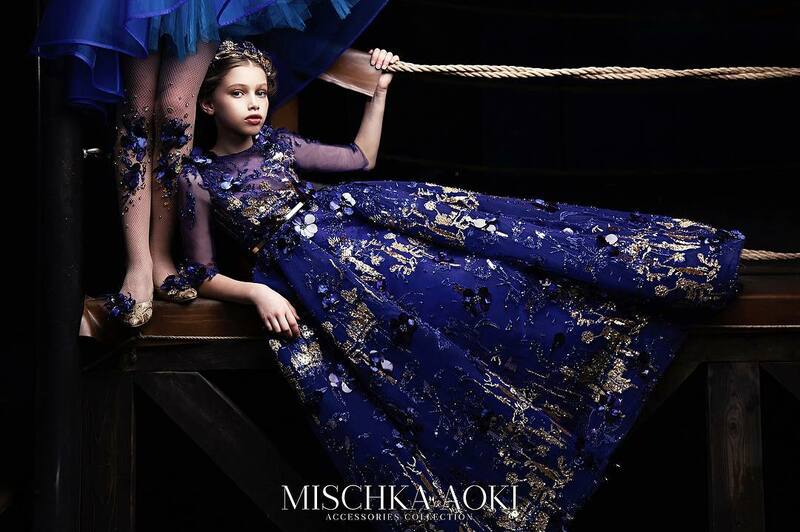 It is embellished with sparkling gold beads on the front and both arms. The collar, cuffs and hem are finely ribbed to compliment this design. A lovely cardigan, which would be great for many occasions. 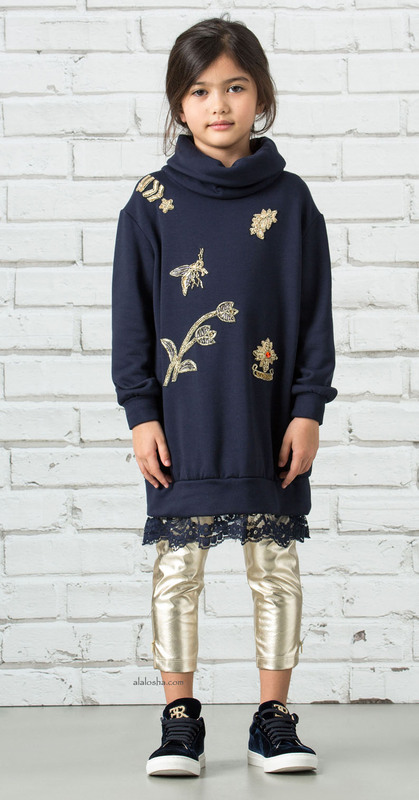 Girls navy blue long-sleeved cowl-neck sweatshirt dress from Ermanno Scervino. Made in the softest viscose blend the dress is both comfortable and warm. 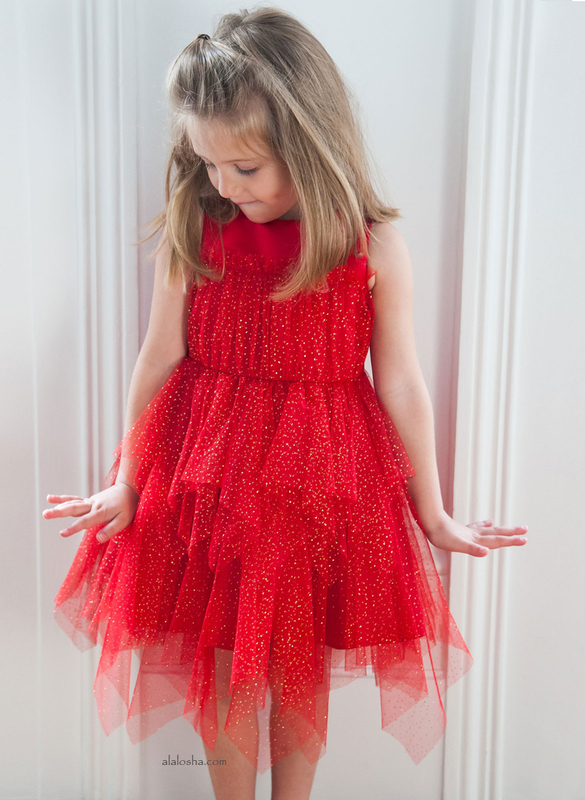 The front of the dress is beautifully embellished with gold and red beading to create a floral and insect design. The dress is finished with a lace trim around the base. 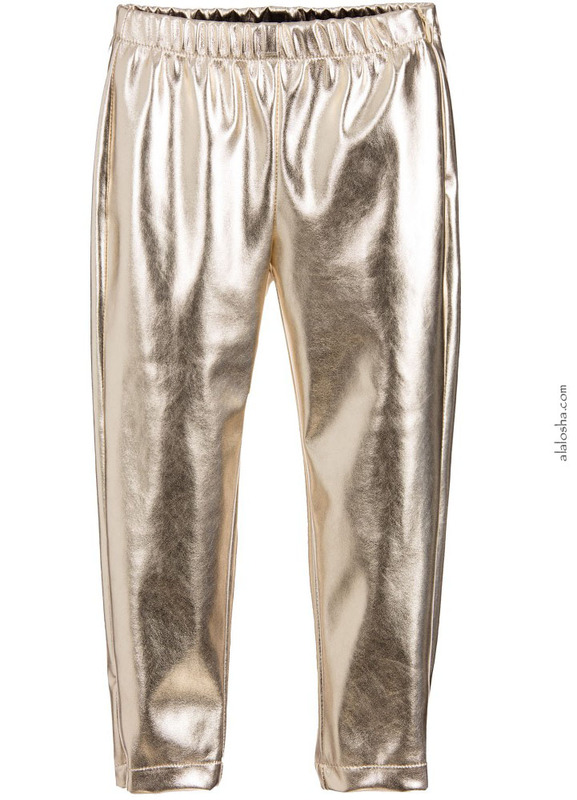 Girls gold trousers by Ermanno Scervino. Made in shiny metallic gold lamé fabric, they have an elasticated waistband with side zip fastening and tapered ankles with zips. 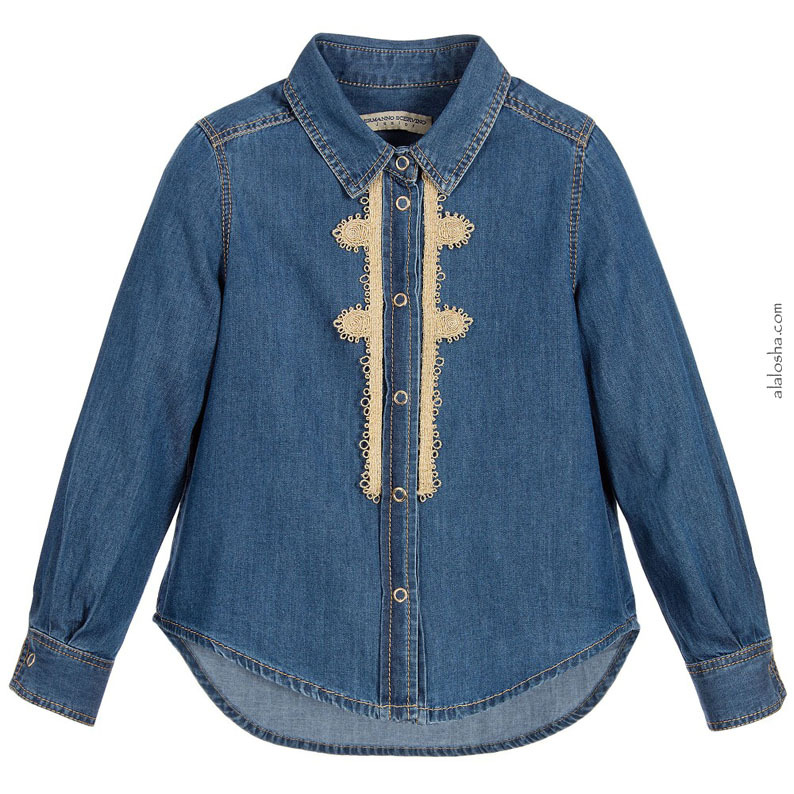 Girls soft blue cotton denim blouse by Ermanno Scervino. A long length blouse with a shaped hem and long sleeves. It fastens with buttons and has sparkly jewels on the front. 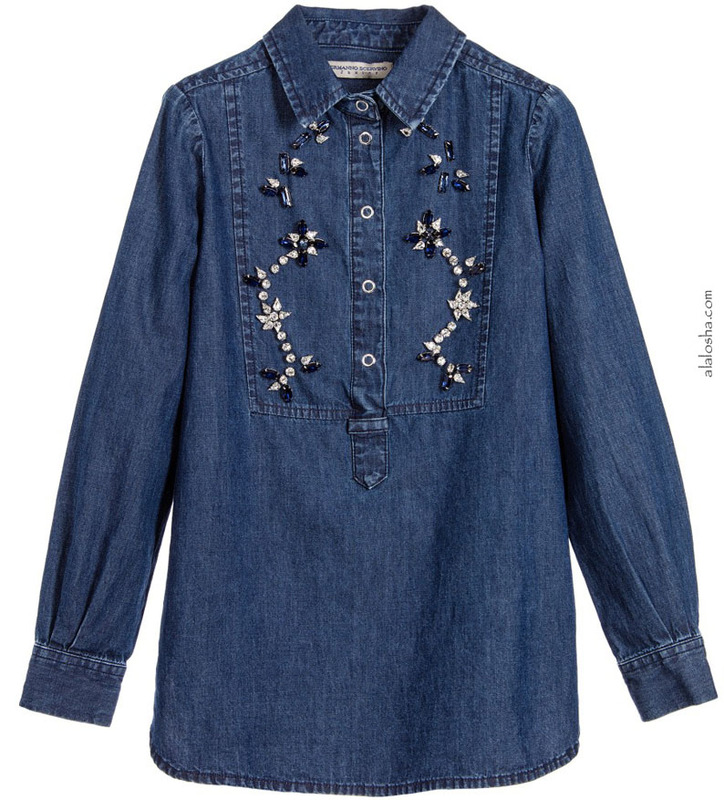 Girls soft, blue cotton denim blouse by Ermanno Scervino. With a shaped hem and pointed collar, the front of the blouse is fastened with poppers, and has sparkling gold brocade trims. 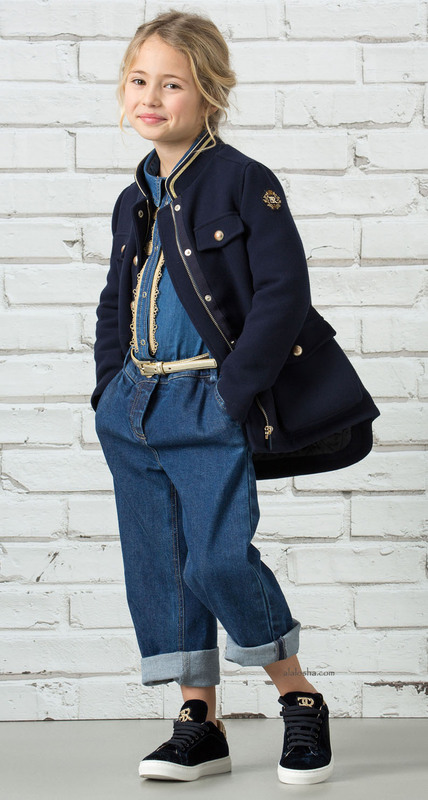 Girls light blue jeans by Ermanno Scervino, made in soft cotton denim. The front features beautiful cut out panels with white lace embroidery and pearl appliqué. They have five pockets, a button and zip fastening, and an adjustable waistband on the smaller sizes.